Basically i love to experiment different types of coffee at home.Long back i had tried and shared homemade Espresso coffee without machine.After that i tried to make Cappuccino at home but it was not upto the mark. 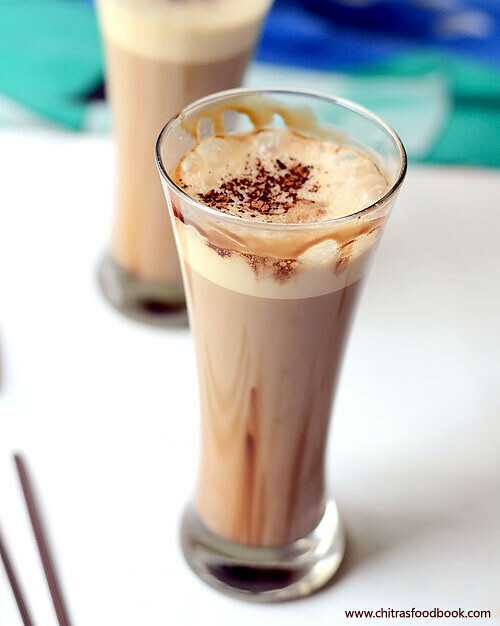 My recent crush is to try Cold Coffee at home. I have not tasted cold coffee in Cafe Coffee Day(CCD).But i have heard a lot from my friends.So I got tempted to give a try on my own & thought Valentine’s day would be a good choice because Sendhil likes to have cold coffee more than our South Indian filter coffee. This morning i made it for the first time following this recipe. I have never thought its so easy to make at home. Its just a mix and blend of instant coffee powder,cocoa powder,milk and ice cubes. With a mild bitterness, it was awesome.Being a coffee lover,i enjoyed every sip thoroughly . 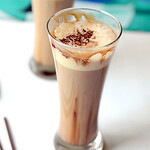 I tried to decorate the glass with hershey choco syrup.But it wasn't perfect :( Cold coffee can be made with & without ice cream.Today i made it without icecream and used Bru instant coffee powder.But I read using Nescafe and ice cream makes it tastier,creamy and rich like Cafe Coffee Day.So try to use them if you have in hand.Soon i must try Frappe,mocha and other variants of coffee .Ok,now lets see how to make cold coffee recipe at home.Try it for your loved ones on this Valentine’s day. Enjoy one coffee with two straw . Heat 3 tbsp of water in a pan and mix coffee powder,cocoa powder along with sugar.Boil the mixture in slow flame till sugar dissolves completely.Keep stirring.Mixture will becomes a thick solution. Switch off the flame and let it cool. 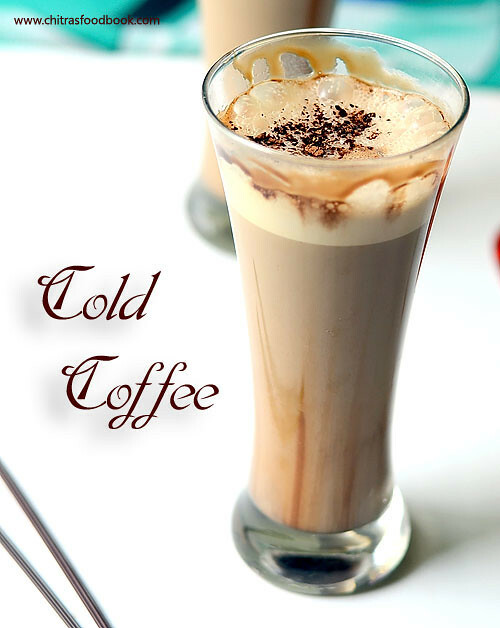 Take a big mixie jar and add 2 cups of milk ( Preferrably boiled milk at room temperature or chilled), 3 tbsp of coffee solution,ice cubes and blend well for few seconds till the coffee becomes frothy. ( Store the remaining coffee solution in a refrigerator and use it the next day itself) Check for taste and add more coffee solution,sugar as per your taste. Transfer it to a glass along with froth and serve it with a scoop of icecream on top.If you are not using ice cream,just decorate it with a sprinkle of coffee powder or cocoa powder.You can also add colorful sprinklers or even choco chips. 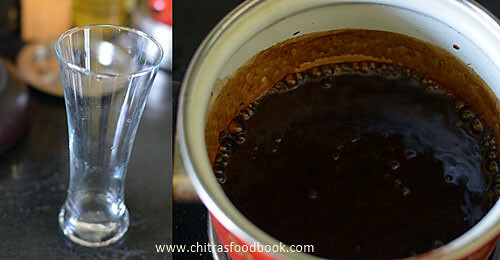 Add more cocoa powder if you like chocolate flavor in your coffee. 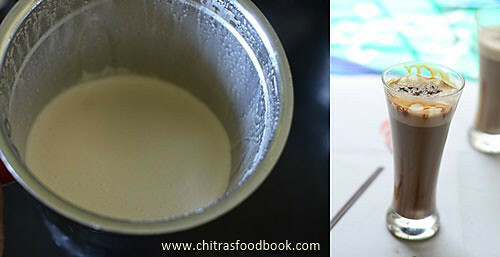 Full fat milk gives more creamy,frothy coffee.But i used low fat milk here. Store the remaining coffee solution in refrigerator and use it the next day.Do not keep it for long. 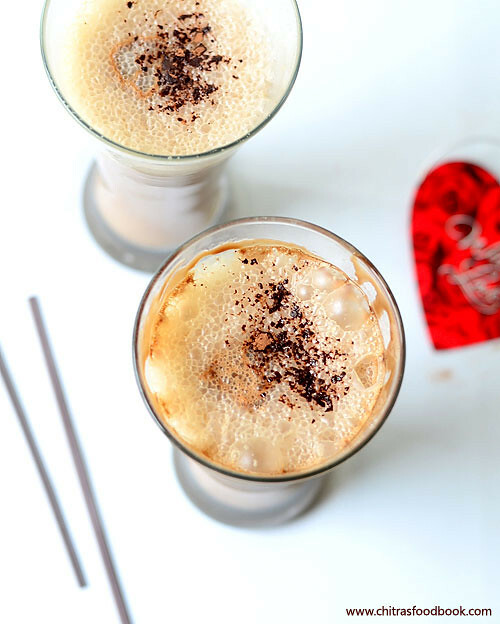 Enjoy this cold coffee with your loved ones and have a lovely day !